Your Biopsy Specimen. Your DNA. Your Diagnosis. Get started with the Know Error DNA test in minutes. Its fast, simple, painless, and a kit will be shipped directly to you or your loved one. One (1) in 30 patient’s biopsy samples get switched with another person or contaminated by another person according to medical journal studies. The result can lead to their cancer diagnosis belonging to another patient! Or in the case of additional genetic testing, the test results may be wrong due to contaminated samples which can lead to incorrect conclusions and therapy. The biopsy evaluation process entails up to 18 complex steps many of which are beyond the control of your physician. Our patented Know Error DNA test protects you as a patient by comparing your reference DNA to the DNA of the biopsy tissue(s) used in your diagnosis to detect and rule out biopsy specimen switching and contamination errors. Anyone who’s had a biopsy or will have a biopsy. Whether you or a loved one has already had a biopsy or are scheduled for a biopsy, the staff at Strand Diagnostics can work with you and your doctor to confirm that your biopsy results actually belong to you. Publications indicate that prostate and breast biopsy patients are at high risk for misdiagnoses. A DNA cotton swab similar to a Q®Tip, is sent in a kit to you or your loved one’s home by Strand Diagnostics. The patient gently rubs the inside of his or her cheek with the swab. 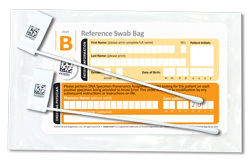 The swab is sent to Strand Diagnostics in the postage-paid envelope provided in the kit. A small piece of the patient’s biopsy is obtained by Strand from the doctor or laboratory. Strand performs the Know Error test by matching the DNA from the swab to the DNA of the biopsy tissue. The patient and doctor are notified by Strand if the DNA matches usually within 72 hours after receipt of biopsy tissue. Get started with the Know Error test in minutes. Its fast, simple, painless, and a kit will be shipped right to you or your loved one’s home. Swab the inside of your cheek. (Carefully follow the instructions included and watch the video on how to swab your cheek). Mail the swab to Strand in the postage-paid envelope provided in the kit. Rest Assured! Both you and your doctor will be notified of the test results usually within 72 business hours after receipt of the biopsy sample. Stay informed! In the future should you ever have an additional biopsy performed, you can simply contact Strand’s client service department to arrange to obtain a sample of the new biopsy. You will never need to order the DNA Swab Kit again! The Know Error DNA test [DNA Specimen Provenance Assay (DSPA)] is a DNA test used to definitively ascribe patient identity and rule out specimen contamination (i.e. assure the specimen purity) when making the diagnosis of cancer and other histopathological conditions. A panel of 16 microsatellite short tandem repeat (STR) markers that recognizes highly variable loci of human DNA is used in a PCR-based assay and analyzed by capillary electrophoresis. The 16 STR loci range from approximately 75 to 400 base pairs in length, and are highly polymorphic in the human population. The collective data from this panel provides a genetic profile, or ‘DNA fingerprint,’ representing the individual. To complete the diagnostic testing cycle for cancer, the genetic profile from the putative malignant specimen(s) is compared with the genetic profile derived from the patient’s DNA reference sample taken via cheek swab at the time of the biopsy procedure. View a more detailed explanation of the four stages in DSPA testing. The diagnostic testing cycle for cancer can involve up to 18 steps and several medical professionals working in different locations. Each year, it plays a critical role in determining the diagnoses and corresponding treatments of millions of patients. 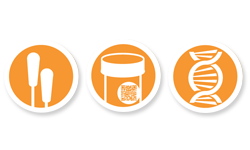 With such a complex process executed at a large scale, the risk of Specimen Provenance Complications (SPCs) is a serious concern for both physicians and patients. SPCs arise due to instances of biopsy specimen transposition, extraneous/foreign cell contamination and misidentification of cells (patients) that occur in clinical or anatomical pathology. In the case of Biomarker Testing a specimen admixture can cause an incorrect finding and confound the biomarker results. When these SPCs are left undetected, they can lead to serious diagnostic errors and adverse patient outcomes. When a cancer diagnosis is assigned to the wrong person, the patient with the false-positive diagnosis could receive unnecessary therapy and treatment (chemotherapy, radiation, surgical procedures, etc.) while the patient with the false-negative diagnosis would not receive the care he or she needs in a timely manner. DNA is extracted from the tissue/buccal swab by lysing the cells. The amount of DNA that is present is typically quantified; depending on the amount of DNA available, the sample may be concentrated or diluted to optimize the amplification reaction. Formalin fixed, paraffin embedded tissues are not an optimal source for DNA, as the fixation process is known to both degrade DNA and to cause chemical crosslinking that can impede downstream tests. 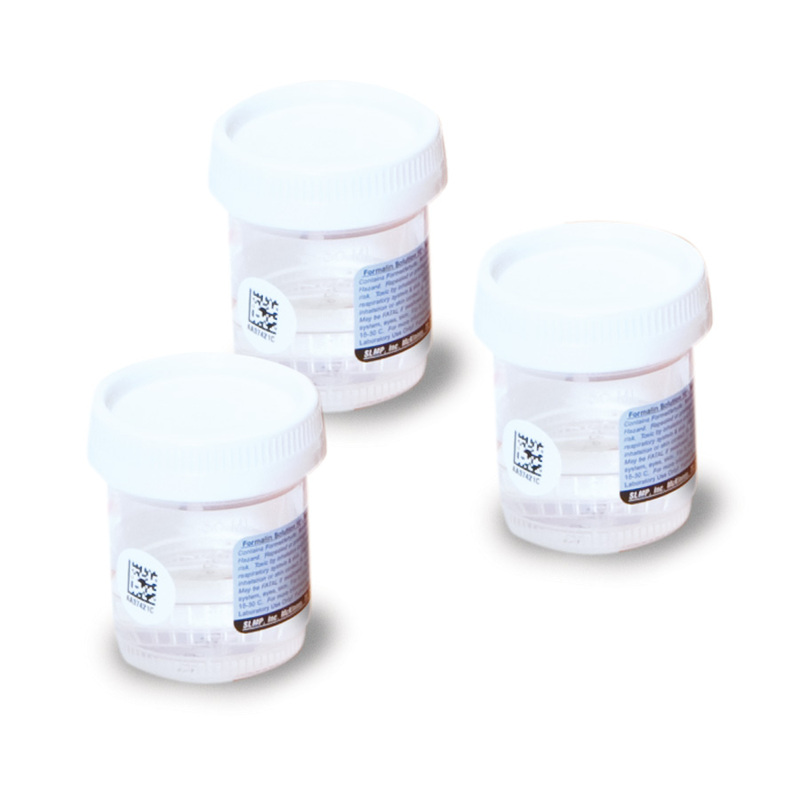 We use specialized reagents and techniques specifically designed to work with this difficult sample type. Very specific locations (loci) in the DNA are copied (amplified) millions of times; each copy has a fluorescent tag attached. This amplification process is very sensitive. If non-patient DNA is present, for example, from extraneous tissue in the water bath or from a cutting station that is not cleaned between samples, the non-patient DNA will be amplified along with the patient DNA, and readily discernable in our test result—even if the foreign cells are not distinguishable under microscopic examination. 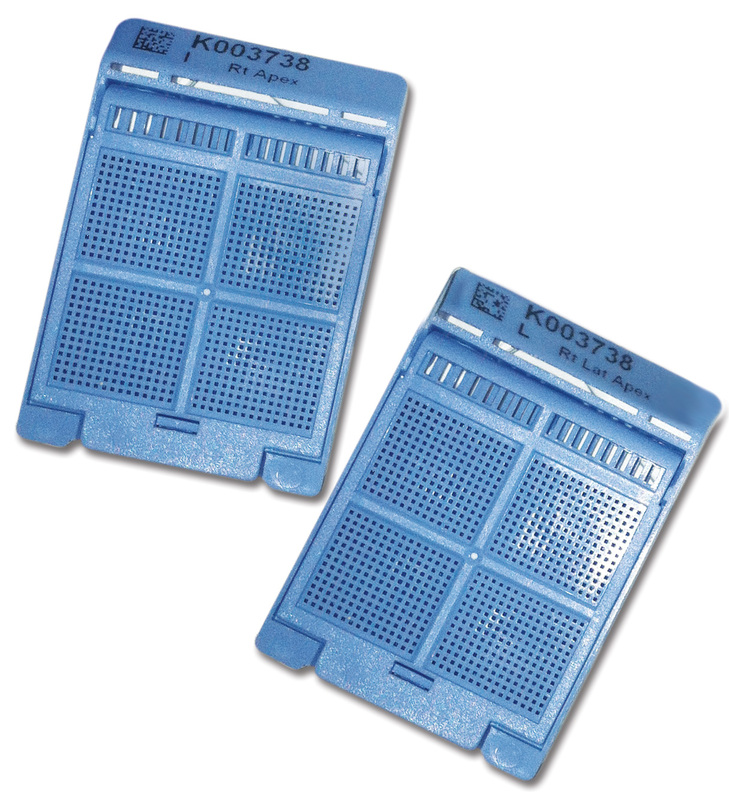 Capillary electrophoresis separates the DNA based on fragment size and charge. The fluorescent tag on each fragment is excited by a laser and the emission is captured by an optical detection system. The combination of fragment size and fluorescent tag allows the assignment of DNA fragments to specific alleles for the 16 individual loci that were tested. Even if useful data is only obtained on a faction of the loci examined, assignment of provenance is generally possible. The DNA profile from each tissue sample is compared to the DNA profile from the corresponding reference sample of known provenance. The comparison includes identifying the loci having data that are acceptable for comparison, identifying the alleles at each locus and calculating the random match probability of the profile. The random match probability is a statistical calculation of the likelihood that the same profile will be observed in another individual chosen from the population at random (i.e. how specific is the identification). The results of each comparison can be categorized most simply as Match, Non-match or Inconclusive (QNS). • MATCH– There are at least 5 loci that are identical between the reference and the tissue, no conflicting loci observed and a random match probability indicating that the profile statistically can be expected only once in a population of at least one hundred thousand people. • NON-MATCH– The reference and the tissue do not match one another. This can be due to a transposition (the reference and the tissue come from different people), contamination (DNA from two or more people in a single sample) or severe genetic anomalies resulting from the cancerous nature of the tissue. • INCONCLUSIVE– The data obtained from the tissue, the reference or both is of insufficient quantity or quality such that a meaningful comparison cannot be made. In the case of non-match or inconclusive results, the treating physician and/or pathologist must consider whether assignment of provenance for that specimen is necessary to render a complete and accurate diagnosis or treatment plan. If so, we recommend that the pathology lab re-submit a new confirmatory tissue scroll from the same paraffin block for which provenance is unverified for repeat DSPA testing, and re-read a newly prepared microscopy slide from the same block in order to confirm the original pathology interpretation. Conversely, if the provenance of the particular tissue can be disregarded without impacting diagnosis or treatment, then repeat testing may not be necessary (for example, if the provenance of five high grade cancer specimens has been confirmed via DSPA, but a 6th specimen yields an inconclusive DSPA result). The medical journal articles summarized below provide further insight into the existence of biopsy specimen contaminations and switches (Specimen Provenance Complications, SPCs) in the diagnostic process. They also confirm the need for DNA Specimen Provenance Assay (The Know Error DNA test) of positive biopsy results to prevent diagnostic mistakes resulting from SPCs. American Journal of Clinical Pathology—Occult Specimen Contamination in Routine Clinical Next-Generation Sequencing Testing. Occult Specimen Contamination in Routine Clinical Next-Generation Sequencing Testing. In evaluating the extent of human-to-human specimen contamination in clinical next-generation sequencing (NGS) data the findings suggest that 3% of NGS cases exhibited a greater-than 5% DNA admixture, samples being so significantly contaminated by another’s DNA that test results were misleading. Jennifer K. Sehn, MD, David H. Spencer, MD, PhD, John D. Pfeifer, MD, PhD, Andrew J. Bredemeyer, PhD, Catherine E. Cottrell, PhD, Haley J. Abel, PhD and Eric J. Duncavage, MD. American Journal of Clinical Pathology. October 2015;144:667-674. The Journal of Urology—Clinical and Economic Implications of SPCs. The Clinical and Economic Implications of Specimen Provenance Complications in Diagnostic Prostate Biopsies. The societal economic burden of biopsy specimen contamination and misidentifications in the case of diagnostic prostate biopsy alone was estimated to be $879.9 million annually. 2.52% of the biopsy cases involved a specimen switch or contamination. False diagnoses due to undetected specimen errors often result in adverse clinical and economic consequences associated with unnecessary and/or delayed treatment. Wojno, K.; Hornberger, J.; Schellhammer, P.; Dai, M.; Morgan, T.; The Journal of Urology.2015 Apr;193(4):1170-7. Rate of Occult Specimen Provenance Complications in Routine Clinical Practice. Specimen contaminations and transpositions within the diagnostic testing cycle for cancer pose serious patient safety and medical-legal issues. This study documented the rate of undetected biopsy specimen errors as part of the routine clinical practice. Results indicated that up to 3.5% of specimens being evaluated may not come from the patient being diagnosed. Since each case involves at least two individuals, this error rate actually underestimates the percentage of patients potentially affected by incidents of biopsy misidentification. The use of the Know Error DNA test (DNA Specimen Provenance Assay, DSPA) to eliminate diagnostic mistakes like these are deemed a valuable and likely cost-effective solution to improve patient safety. Pfeifer JD, Liu J. American Journal of Clinical Pathology. 2013;139(1):93-100. Biopsy Misidentification Identified by DNA Profiling in a Large Multicenter Trial. Over 13% of biopsy specimens identified in this trial were contaminated with unidentified sources of DNA not from the patient. 171 biopsy cases (1.5%) were so sufficiently compromised by contamination additional slide tissue was requested for testing. The authors concluded that the potential for biopsy misidentification should be a concern in both the clinical trial setting and routine clinical practice. Marberger M, McConnell JD. Fowler I, et al. Biopsy misidentification identified by DNA profiling in multicenter trial. Journal of Clinical Oncology. 2011; 29(13):1744-1749. A dataset of over 4,200 patients diagnosed with breast cancer was analyzed for specimen provenance errors. 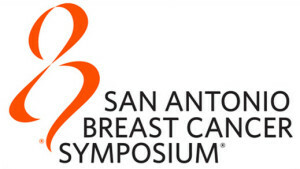 After a pathologic diagnosis of breast cancer was made, a portion of the diagnostic specimen was sent to an independent DNA laboratory (Strand Diagnostics) where genetic short tandem repeat profiles were compared to the patient’s reference DNA to rule out the presence of undetected Specimen Provenance Complications (SPCs) prior to treatment. DNA Specimen Provenance Assay (DSPA) test confirms identity of transposed specimens. After undergoing an ultrasound-guided breast biopsy at her physician’s office, a 54-year-old female patient (Patient A) was diagnosed with invasive ductal carcinoma in her right breast. Less than two months after the diagnosis was rendered a simple/partial mastectomy was performed to treat the cancer. However, when the extracted breast tissue was examined by a pathologist following the surgery, there were no cancer cells detected. These findings were inconsistent with the original biopsy and radiology results, which lead the pathologist to contact Strand to investigate the situation and help determine whether Patient A really had cancer. MATERIALS AND METHODS: Upon receiving notification of this discrepancy, Strand sent a Specimen Source Verification (SSV) kit to the pathologist so a DNA reference sample (buccal swab) and tissue samples could be collected for the patient in question (Patient A). A DNA Specimen Provenance Assignment (DSPA) test indicated that the four slides used to render the original diagnosis and the buccal swab findings were a complete DNA non-match. Following these results, three additional SSV kits were sent out so Patient A could be re-swabbed for additional verification, along with the other two patients who were biopsied at the physician’s office the same day (Patient B and Patient C). Buccal swabs for these other two patients were tested against the original four malignant samples that were deemed a non-match for Patient A. In addition, samples of the extracted mastectomy tissue were also analyzed in this next round of testing. RESULTS: DNA Specimen Provenance Assignment (DSPA) testing confirmed that the original four tissue samples that led to a cancer diagnosis did not belong to Patient A (the benign mastectomy tissue, however, was a match). Results for Patient B also indicated a DNA non-match, and it was determined that the tissues in question actually belonged to Patient C. It is unclear how this specimen transposition occurred, but regardless of the cause, this situation resulted in misdiagnosis and an unnecessary surgery for Patient A, as well as delayed treatment for Patient C who actually had cancer. CONCLUSIONS: A DSPA test was able to verify the provenance of the samples in question and enabled the cancer diagnosis to be assigned to the correct patient. Had testing been performed on a prospective basis using the patented know error® system, the error could have been identified prior to the unnecessary treatment of Patient A. The hospital involved in the case is now using the know error® system with all breast biopsies procedures to complete the diagnostic testing cycle and protect its patients from adverse outcomes. DNA testing confirms presence of sampling fraud in infectious disease study. A large, global pharmaceutical company was conducting an infectious disease study overseas. Investigators had become suspicious of fraudulent specimen collection due to multiple instances wherein specimens identified as coming from distinct individuals appeared to be from a common donor. To definitively establish whether or not fraud had occurred, the company ordered DNA Specimen Provenance Assay (DSPA) to determine how many unique individuals’ genetic profiles were present among the suspicious specimens. MATERIALS AND METHODS: Suspicious blood samples from the study were submitted to Strand for DNA Specimen Provenance Assay (“DSPA”) testing. DSPA employs Short Tandem Repeat (“STR”) analysis originally developed by the forensics community and often referred to as “genetic fingerprinting.” The technique examines a panel of 16 microsatellite markers representing highly variable loci on the human genome. The collective STR profiles from these loci constitute a genetic “fingerprint” which can uniquely identify an individual with precision exceeding 99.99%. RESULTS: Of the 42 blood samples submitted for DNA testing only 18 unique individuals’ profiles were present, confirming that the actual subject population was much smaller than the fraudulently inflated population reported by the enrollment site. Had this irregularity gone undetected, the integrity of the study might have been significantly compromised. Early identification of the fraud enabled the study sponsor to exclude these samples from the data set and take corrective action to preserve the validity and integrity of study results. Had the problem not been identified, study results may have led to invalid conclusions with significant financial and clinical ramifications. It is important to note that suspicion of fraudulent activity was only raised in this case due to investigators’ astute observation of common chemical traits unique to the specific trial protocol, which implied that allegedly disparate samples were from a common donor. In the vast majority of trial settings, routine lab testing would not have detected such patterns. The sampling error would have been completely unknown to the investigators, leading to incorrect study conclusions of potentially drastic consequence. CONCLUSIONS: It is well known that complications involving specimen transposition and contamination are inherent across all clinical settings, impacting as many as 3% of cases in tissue histopathology specifically.1 Specimen handling in the research and clinical trial context carries these same risks, plus the added risk of fraudulent activity related to data representation and/or specimen acquisition. Whether the root cause is intrinsic handling errors or deliberate fraud, these complications are typically impossible to detect other than through DSPA testing. This case presents one representative example of the fraud risk which pervades clinical trials, but has historically been tolerated by the research community given the lack of available methods to identify and mitigate this risk. However, recent advances in the availability of cost effective and timely DSPA testing protocols available mean that investigators now have a viable tool to completely eliminate specimen provenance ambiguity from the research paradigm. Prospective DSPA testing through the know error® system is quickly becoming the new standard of care for diagnosing patients with cancer in a variety of specialty areas, as the imprecision inherent in those testing cycles is no longer considered acceptable by physicians who now demand identity verification before rendering treatment to patients. For precisely the same reasons and more (fraud risk), investigators and regulators should consider study results achieved without DSPA testing to be potentially suspect. The average cost to obtain approval for a major pharmaceutical compound exceeds $4 billion, and in some cases can be well over $11 billion. A single clinical trial can cost as much as $100 million, with many trials required in order to yield a single approved drug.2 Considering the magnitude of societal benefit and financial investment which hinges upon the accuracy of study data, the potential implications of compromised data due to undetected specimen provenance complications cannot be overstated. Multi-billion dollar decisions with the potential to impact millions of lives demand data which embody the highest degree of accuracy and integrity available to science. Investigators should consider that the modest marginal cost of adding prospective DNA testing via the know error® system to a study protocol is readily justified given the ramifications of an invalid study conclusion resulting from preventable specimen provenance complications including fraud. 1. Pfeifer JD, Zehnbauer B, Payton J. The changing spectrum of DNA-based specimen provenance testing in surgical pathology. Am J Clin Pathol. 2011;135:132-138. 2. Herper M. The truly staggering cost of inventing new drugs. Forbes.com. www.forbes.com/sites/matthewherper/2012/02/10/the-truly-staggering-costof-inventing-new-drugs/. Published February 2, 2012. Accessed June 21, 2012. DNA Specimen Provenance Assay (DSPA) testing clarifies identity of mixed prostate biopsy samples. Strand Diagnostics was contacted by a staff member at a reference laboratory after it was suspected that several biopsy jars might have contained prostate specimens from multiple patients. This was the result of a physician’s office error in which multiple tissues were placed into the same jars, making it unclear whether these were from the same patient or two different people. DNA Specimen Provenance Assay (DSPA) testing was utilized to determine the origin of all tissue samples from these mixed jars and ensure the appropriate patients could be notified of their diagnoses. MATERIALS AND METHODS: A total of 21 prostate biopsy jars were collected in this case, 12 labeled for Patient A and nine labeled for Patient B. Upon further discussion with the physician’s office, the reference lab learned that three of the jars submitted for Patient B contained multiple cores from both Patient A and Patient B. A total of 12 tissue samples were placed in these mixed jars, and the reference lab requested that DSPA testing be performed on all of them so each core could be linked to the proper patient. DNA reference samples were obtained for both patients via cheek swab and compared with the tissues in question. RESULTS: Six of the tissues were determined to be a DNA match for Patient A, five of the tissues were a DNA match for Patient B and one tissue contained DNA profiles from both patients. It was deemed unnecessary to retest this contaminated sample. The reference lab reported that Patient A was diagnosed with cancer, while the tissues belonging to Patient B were benign. 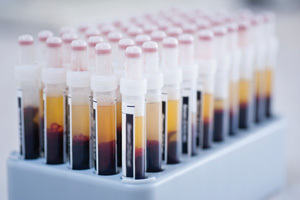 CONCLUSIONS: DSPA testing performed by Strand determined the provenance of all specimens in the mixed biopsy jars and allowed the appropriate diagnosis to be assigned to each patient. This was extremely important to ensuring proper treatment because one patient tested positive for cancer and the other did not. Use of the know error® system on a prospective basis (as opposed to retrospective in this particular case) would have saved the practice thousands of dollars in testing fees and allowed for a more timely diagnosis for each patient. Specimen provenance of unknown tissue in mixed sample jar determined through DNA testing. The Director of Operations for a large pathology services provider contacted Strand after his laboratory received a jar containing two specimens that, upon visual inspection, appeared to be completely different tissue types, presumably from different patients. As an existing Strand customer, the facility had specimen source verification kits on hand and was able to send in samples quickly for DNA Specimen Provenance Assay (DSPA) testing to determine if the specimens were in fact from two different patients. MATERIALS AND METHODS: The pathologist at the lab evaluating the biopsies in question suspected immediately that the specimens were likely from two different sources based on their visual appearance. Small samples from the paraffin embedded tissue blocks were sent to Strand for analysis. DNA Specimen Provenance Assay (DSPA) testing confirmed that the genetic profiles obtained from each sample did not match—meaning the specimens had not been collected from the same patient. After consulting with the practice where the samples were taken, it was determined that the first specimen was a skin lesion likely collected from Patient A while the second specimen was cervical tissue likely collected from Patient B. The cervical tissue had been collected approximately four days after the skin lesion, but it was erroroneously placed in the same jar and then labeled for Patient B. Following this discovery, a DNA reference sample taken via cheek swab from Patient A was submitted to Strand to confirm a match with the unlabeled tissue (skin lesion) by means of a DSPA test. RESULTS: DSPA testing confirmed that the tissue samples in question were from two different patients. * Subsequent testing of the skin lesion and reference sample confirmed that the lesion was a match for Patient A. The skin lesion was discovered to be positive for cancer, thus making it even more important to assign provenance to the specimens in a timely manner. With both samples properly identified, the patients could be notified of their testing results and did not have to undergo re-biopsy procedures to receive a diagnosis. CONCLUSION: Through the relationship with Strand, the laboratory was able to help its client (the practice) solve a potentially serious problem and prevent any inconvenience or harm to the patients involved in the error. While the laboratory uses the know error® system on a prospective basis, this particular situation shows the value of having a specimen source verification kit available for retrospective cases when an error is suspected. *NOTE: The client deemed it unnecessary to perform DSPA testing to confirm a match between the cervical tissue and Patient B because the jar was correctly labeled for that individual. Strand recommended otherwise. 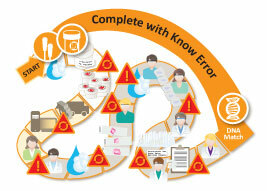 Use of the know error® system prevents two patients from having incorrect treatments. A large urology group practice uses the know error® system (which includes DNA Specimen Provenance Assignment “DSPA” testing) as part of routine clinical practice to identify otherwise occult (hidden) specimen provenance errors which can lead to patient harm. SUMMARY: Buccal swabs (included in the know error collection kit) were received by Strand Diagnostics for two patients, Patient A & Patient B. Both had prostate biopsies at the same practice, on the same day whereby the know error® system biopsy kits and protocol were utilized. Pursuant to the practice’s protocol, tissue samples for Patient A, who was putatively diagnosed with cancer, were sent to Strand Diagnostics for DSPA testing. When Strand Diagnostics accessioned the tissues for Patient A it was noted that, though the patient names matched, the barcode on the tissues did not match the bar code on the buccal swab. Due to this discrepancy, DSPA testing was not performed and the client was immediately notified. The practice believed the tissues were indeed those of Patient A and instructed Strand Diagnostics to test “name to name” (i.e. ignore the bar codes). The DSPA test resulted in a complete DNA non-match. Strand Diagnostics recommended that Patient A be re-swabbed and that new tissues be cut from the blocks labeled for Patient A. It was also suggested to submit the tissues for Patient B in an attempt to confirm the provenance of Patient B’s tissues (even though Patient B was diagnosed as “negative for cancer”). RESULTS: The second round of DSPA testing on Patient A ALSO resulted in a complete DNA non-match. The DNA from both of the buccal swabs from Patient A DID match each other suggesting that it was the tissues that were mislabeled. Further, it was confirmed that the buccal for Patient B as compared to the tissues labeled for Patient B was also a complete DNA non-match. Further analysis proved that the tissues labeled for Patient A actually belonged to Patient B and vice versa. The original pathology reports for the patients were the reciprocal and had to be revised to show the correct diagnosis for each patient. CONCLUSIONS: In a timely fashion (a 4 day turn-around-time for the initial report), Strand Diagnostics’ know error® system was able to prevent a mislabeled (false-positive) cancer-free patient from having unnecessary prostate surgery and likewise a mislabeled (false-negative) cancer patient from going untreated. Without the use of the know error® system and DSPA testing, the error might not have been found until after radical prostatectomy; and an undetermined length of time might have passed before treatment of the patient with cancer. This client continues to use the know error® system as part of their routine clinical practice providing their physicians with increased diagnostic accuracy and their patients with the highest level of safety. The know error® system identifies patient misdiagnosed with prostate cancer. This case involves the misdiagnosis of two prostate biopsy patients due to a specimen switching error. When Patient A’s two positive prostate tissue samples were received for testing, it was discovered that neither sample matched the patient’s DNA reference sample (collected via cheek swab at the time of his biopsy procedure) indicating that the tissues did not actually come from Patient A. MATERIALS AND METHODS: After the non-match report was issued for Patient A, samples were recut from the same block of cancerous paraffin-embedded tissue and submitted to Strand Diagnostics for retesting. The results of this second test were consistent with the original findings indicating a non-match. Patient B was biopsied at the surgical center on the same day as Patient A and received a negative diagnosis. Tissues from the block used to render Patient B’s diagnosis were cut and submitted to Strand for comparison with his reference sample, which also resulted in a DNA non-match. Patient A’s DNA reference sample was a match for the tissues submitted for Patient B, suggesting that a biopsy sample switch had occurred. New DNA reference samples were then collected for both patients, as well as additional tissues samples for final verification. RESULTS: DNA profiles obtained from the new buccal swabs matched those obtained from the original buccal swabs for each patient. It was then confirmed that the tissues in the block originally submitted for Patient A were a match for Patient B and vice versa. Therefore, it was concluded that these patients’ blocks were switched (evidently during the biopsy evaluation process), and thus the diagnosis of cancer ascribed to Patient A was actually meant for Patient B. This biopsy testing process with these two patients involved multiple steps and processes (which is standard practice). For example: the DNA reference sample and biopsy samples were collected at the surgical center; the tissues were then sent to one lab to be cut; and then transferred to another for the pathology reading. Thus it is difficult to pinpoint the exact location where the error occurred. CONCLUSIONS: Through the use of the patented know error® system, this sample misidentification error was detected prior to any unnecessary treatment taking place for Patient A. DNA Specimen Provenance Assignment (DSPA) testing allowed the appropriate diagnosis to be assigned to each patient. Patient B was notified of his cancer diagnosis and proceeded with the recommended treatment. Know Error testing verifies identity of mislabeled prostate specimens. Two positive prostate biopsy specimens were switched at a practice’s in-house pathology lab. The issue was uncovered by the use of Strand Diagnostics’ know error® system after the tissue samples submitted for two patients biopsied at the practice did not match the DNA reference samples collected via cheek swab at the time of their biopsy procedures. The lab manager was notified immediately of the discrepancy so that additional testing could be performed to properly identify the origin of the tissue samples in question. She was also instructed to let the physician know about the incident to avert any improper treatment of the patients involved. MATERIALS AND METHODS: The genetic profile of the tissue submitted for Patient A did not match the profile obtained from his DNA reference sample. Instead, it was a match for the reference sample submitted for Patient B who was biopsied at the practice on the same day. The DNA testing results for Patient B yielded a similar conclusion; his tissue matched the reference sample submitted for Patient A. Additional tissues were submitted for both patients to confirm the findings. As with the preliminary report, this second round of testing also indicated that the resubmitted tissues did not match the original reference samples for either patient. To further the investigation, new DNA reference samples were collected for both patients to be tested against the original swabs and tissues. RESULTS: Results from this last round of testing showed that the genetic profiles obtained from the replacement swabs matched the original swabs, but were a DNA non-match for the respective tissues submitted for each patient. The original and new swabs for Patient A were a match for the tissues submitted for Patient B. And as expected, the original and new swabs for Patient B were a match for the tissues submitted for Patient A. This confirmed the suspicion that the tissue blocks had been switched at the laboratory. Further conversations with physicians and laboratory staff revealed that the tissue blocks were not labeled correctly which ultimately caused the switch to occur. CONCLUSIONS: This particular case reveals that sample misidentifications can occur in any environment, even in a closely monitored, in-house pathology laboratory. Because the know error® system was used as part of routine clinical practice, this problem was identified prior to any unnecessary treatment of either patient. This intervention also protected the practice which might have been liable for medical malpractice costs associated with a misdiagnosis. Strand continues to provide clinical support to help the practice deliver a higher standard of diagnostic accuracy and patient safety. The rate of incidence in misattributed specimen provenance among surgical breast biopsies. 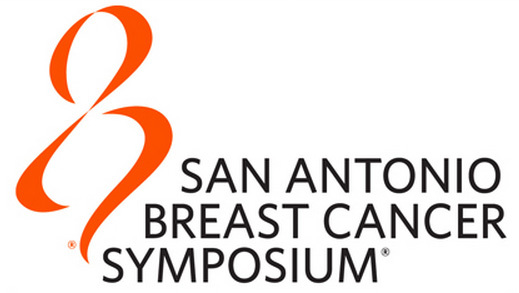 As presented at the 2014 San Antonio Breast Cancer Symposium: A. Lerner, MD, ABTC LLC. ; A. Bush, Ph.D, Strand Diagnostics LLC. ; A. Kenler, MD, Bridgeport Hospital, Yale New Haven Health, Bridgeport, CT.; D. Dorfman, MD, Zwanger-Pesiri; T. Morgan, Strand Diagnostics LLC. ; B. Boyd, RN, ABTC LLC. ; William Burak, MD, ABTC LLC. ; R. Fine, MD, ABTC LLC. Poster Presentation Content, December 12, 2014. OVERVIEW: The medical literature reports extensively on the diagnostic challenges posed by tissue contamination and transposition among surgical biopsy specimens. These specimen provenance complications (SPCs) can lead to a misdiagnosis of cancer when no cancer is present, resulting in unnecessary surgery or other non-indicated therapy in an otherwise healthy patient, and a potential delayed diagnosis of a reciprocal patient. The histopathology process involves many manual steps during which specimens must be estranged from their identification, and provenance errors are often invisible absent DNA analysis. Prostate biopsy is the clinical setting in which specimen provenance has been most widely studied, with complication rates reported to persist in over 0.9% of positive diagnoses despite best efforts to minimize errors. Because the processing workflow is virtually identical for histopathology specimens of all types, there is reason to expect that error rates among breast biopsy specimens are similar to prostate, though data validating this expectation have not previously been available. METHODS: We analyzed a dataset of over 4,200 patients diagnosed with breast cancer between February 2011 and April 2014. All biopsies were collected using a uniform best-practice protocol including forensic chain of custody principles, bar-coding of specimen containers, and collection of the patient’s reference DNA sample via buccal swab during the biopsy procedure. After a pathologic diagnosis of breast cancer was made, a portion of the diagnostic specimen was forwarded to an independent DNA laboratory (Strand Diagnostics, Indianapolis, IN) where genetic short tandem repeat profiles were compared to the patient’s reference DNA to rule out the presence of undetected SPCs prior to proceeding with therapy. RESULTS: 3,545 breast cancer cases from 7 practices contributing 100 or more cases each were examined. DNA testing revealed occult provenance complications in 16 cases (0.45%), of which 6 (0.17%) were a complete transposition with another patient and 10 (0.28%) reflected contamination of the specimen by tissue from one or more unidentified individuals. Four (57%) of the practices experienced at least one provenance error during the study period, with the highest error rate being 1.41% at one practice. Pathology was performed by 14 different laboratories, 6 (43%) of which were implicated in occult SPCs. Finally, patients seen by 8 (13%) of the 61 physicians performing surgical biopsies in the cohort were subjects of occult specimen provenance errors. SUMMARY: These data, while limited in statistical power, suggest that the incidence of SPCs among breast biopsies is comparable to that previously reported for prostate biopsies, and that errors are distributed broadly across laboratories, practices, and physicians. Due to the potential clinical consequences for patients with undetected SPCs, and the medical malpractice implications, further study of the nature and economics of provenance complications in the breast biopsy setting is warranted. REFERENCE: Pfeifer JD, Liu J. Rate of Occult Specimen Provenance Complications in Routine Clinical Practice. American Journal of Clinical Pathology. 2013;139:93-100.